Velvety-voiced, internationally acclaimed mezzo-soprano Risë Stevens (b. Bronx, NY, 11 June 1913; d. New York, NY, 20 March 2013) was on the roster of the Metropolitan Opera for nearly a quarter of her century-long life. Between 1938 and 1961 she was the Carmen (in Bizet’s opera) and the Dalila (in Saint-Saëns’s Samson et Dalila) of choice, supplementing her wide repertory with the favorite roles of Cherubino (Mozart’s The Marriage of Figaro), Orlovsky (Johann Strauss’s Die Fledermaus), Octavian (Richard Strauss’s Der Rosenkavalier), and Mignon (Ambroise Thomas). She was the Hansel in the first complete opera recorded by the Metropolitan Opera Company, Humperdinck’s Hansel and Gretel, in 1947. 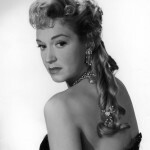 Stevens sang in motion pictures as well, and in several major television productions, making frequent appearances as a guest on Ed Sullivan and various late-night variety shows. Her rich list of recordings, which includes surprises like The King and I, Show Boat, and Porgy and Bess, has never ceased to lengthen with reissues and compilations. In 1945 her voice was insured with Lloyd’s of London for a million dollars. Risë Gus (after Aunt Augusta) Steenberg was the daughter of Christian Steenberg, a Norwegian-born advertising salesman, and Sadie Mechanic, a Jewish American. She grew up in the Bronx, Queens, and Brooklyn, while her mother encouraged her daughter’s singing from the earliest signs of her special talent. As a child, Risë sang for a dollar a week on The Children’s Hour radio program on WJZ – Milton Cross, later famous as the host of the Metropolitan Opera’s Saturday afternoon broadcasts, was the program’s host. By her late teens, Risë was a regular member of Brooklyn’s Little Theater Opera Company and had adopted the professional surname of Stevens. One evening the respected Juilliard voice teacher Anna Schoen-René had occasion to hear her in a leading role and was impressed enough to accept her as a private student, arranging for Risë to enter the Juilliard School on scholarship in the fall of 1933. Meanwhile Stevens helped support herself by modeling fur coats (in the heat of summer) and singing on local radio. Mademoiselle Schoen-René generously financed a summer’s study for her at the Mozarteum in Salzburg under Marie Gutheil-Schoder, one of the foremost German singers of the time (she had performed the premiere of Schoenberg’s notoriously challenging Erwartung in 1924). Stevens made her official operatic debut in the title role of Ambroise Thomas’s opera Mignon in Prague in 1936. Her first appearances with the Metropolitan Opera took place two years later, first in Philadelphia as Octavian in Der Rosenkavalier, then in New York as Mignon. She was to earn her greatest fame, however, at the great House that became her home, for her torrid interpretation of Bizet’s Carmen, frequently sung opposite the incomparable tenor Richard Tucker as Don José. Her 124th performance as Carmen was, appropriately, her farewell in April 1961. With Bing Crosby in Going My Way (1944), a film that was nominated for ten Oscars and won seven including Best Picture, Risë Stevens played essentially herself, and appeared in a scene from Carmen at the Metropolitan Opera. But the films she made thereafter were all for television: the first two, Der Rosenkavalier (Stevens sang Octavian) in 1949 with Eleanor Steber, Erna Berger, and Emanuel List, and Carmen in 1952 with Richard Tucker, Robert Merrill, and Nadine Conner, were the operas in their original form. 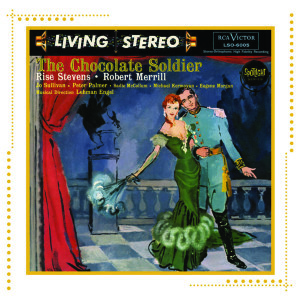 The Chocolate Soldier – the operetta by Oscar Straus, this time – with Stevens as Nadina and Eddie Albert as Bumerli, was broadcast in 1955. A new musical on Hansel and Gretel by Alec Wilder and William Engvick was broadcast in 1958 with Red Buttons and Barbara Cook in the title roles; Risë Stevens was the Mother and Hans Conried played the Witch. The same year, Richard Adler (famed for Damn Yankees and The Pajama Game) wrote a musical for television based on Little Women, with Florence Henderson and Joel Grey; Risë Stevens again played the Mother. Stevens’s last sojourn in the world of film was in 1974 as the voice of Glinda the Good Witch in the animated Journey Back to Oz, with a star-studded cast contributing their voices as well – Liza Minnelli, Mickey Rooney, Ethel Merman, Mel Blanc, Herschel Bernardi, Margaret Hamilton, Milton Berle, Paul Ford, Paul Lynde, Larry Storch, and Danny Thomas. 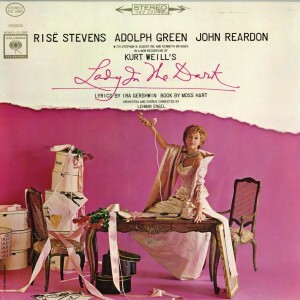 Stevens starred in two of the several Studio Cast Albums produced by Goddard Lieberson for Columbia Records: The Chocolate Soldier (Straus, 1958) opposite Robert Merrill, and Lady in the Dark (Weill, 1963) with Adolph Green and John Reardon. 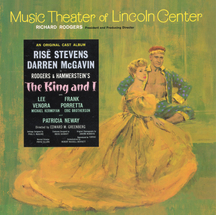 Her performance as Anna Leonowens in The King and I at the Music Theater of Lincoln Center in 1964 was also recorded for Columbia and is available from Sony Masterworks. In 1964 Stevens returned to the Met as an administrator, managing, with Michael Manuel, the new touring Metropolitan Opera National Company. That Company survived for only three years, but Stevens later became Executive Director of the Metropolitan Opera National Council Regional Auditions. From 1975 to 1978 she also served as President of the Mannes College of Music, and was awarded an honorary doctorate from The New School, of which Mannes is a part, in 1980. In 1990 she received the Kennedy Center Honors in Washington. She was inducted into the American Classical Music Hall of Fame in 2008, and received Opera Honors from the National Endowment for the Arts in 2011. Risë Stevens was married for 62 years to the Hungarian actor Walter Surovy, from 1939 until his death in 2001. Their son Nicolas Surovy is a television actor working in California.